Hello! 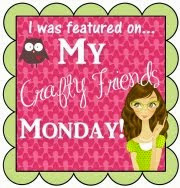 Today we have a very colorful combination for our Create with Connie and Mary Thursday Challenge! 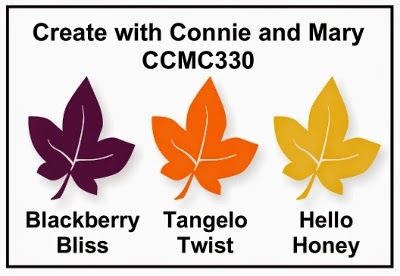 The In Colors of Hello Honey, Tangelo Twist and Blackberry Bliss make for a delicious creative combo! Yum! I love these pumpkins from the Fall Fest set and the Fun Fall Framelits to die cut them in a snap! I thought I might be about to put them away to work on Christmas but they were just too perfect for these colors. I made a card that could be used for a personal thank you note or for a Thanksgiving card to let someone know how grateful you are for them. The pumpkins were inked with Hello Honey then the edge sponged with Tangelo Twist before stamping. The "thanks" stamp was sponged in the center with Tangelo Twist then the edges with Blackberry Bliss; where the colors overlapped gave a lovely bronze-like color and when the pumpkins were added, you really don't even see the pure Tangelo Twist. Hmm. This layer was added to layers of Tangelo Twist and Hello Honey. The "Thankful for" was diecut with the Bitty Banners and backed with a Blackberry Bliss diecut banner which was cut in half and added to the back. Some Blendability-colored Rhinestones add the final touch. Inks: Hello Honey, Tangelo Twist, Blackberry Twist. Be sure to check out the cards the other Challenge Design Team members made with these gorgeous colors! Just go to Create with Connie and Mary and while you're there also see the guidelines for joining us in this challenge! 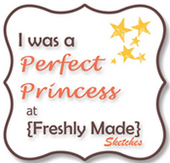 It's fun and also helpful to give one a starting place for a project!! Outstanding use of the colors! I love how you layered the pumpkins over the sentiment. 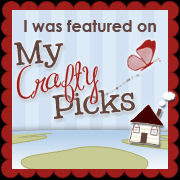 beautiful card, Mararet....love the layout and especially the colors! I love how you covered the greeting with the pumpkins! Would never have thought of that, but it looks fabulous! Such a pretty card! Margaret this card is stunning! I love the way you blended the colours of the Seasonally Scattered stamp and on the pumpkins. The effect when layered together is just beautiful. Beautiful card! Really shows the versatility of this set! Lovely! 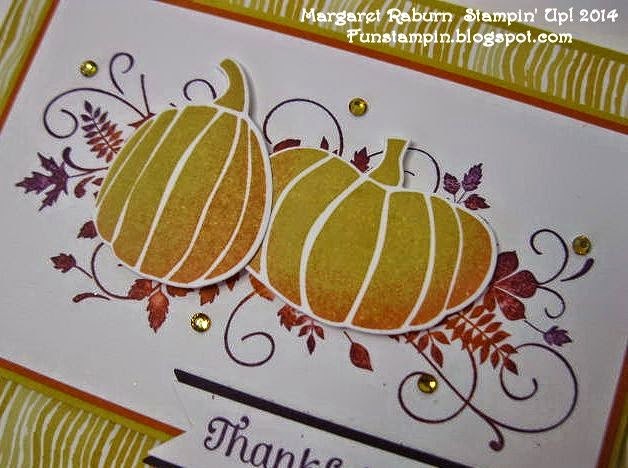 I love how you blended the colors on the your stamped panel and the pumpkins! Everything works so beautifully together to make it all so elegant! Love it! What a gorgeous card!! I love that you covered up the sentiment with the cards so the swirls show around them...super clever!! So pretty, love the shading on the pumpkins! And a wonderful way to get more mileage out of that stamp set! Great job with the color challenge this week! Fantastic card, the sponging is out of this world!